Yesterday Leighton Smith had a caller who claimed to work in advocacy against family violence. She would not accept that more Maori children were victims and insisted she had seen statistics to the contrary. But out of 88 children killed between 2002 and 2006, 48 were Pakeha. Maori were 28. The remainder were Pacific Island and a few Asian. Here are the statistics that prove she was wrong. In the period 2002 - 2008 (two years beyond Kiro's time frame) 49 children died through family violence. 17 were Pakeha, 23 were Maori. 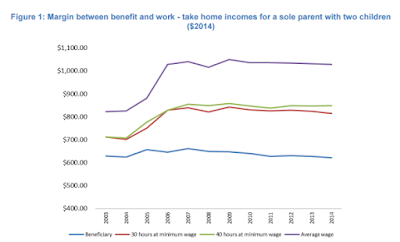 The first thing this graph highlights is how WFF and other means-tested assistance (like the accommodation supplement) reduces the incentive to work longer hours. Look how close the minimum wage lines are at 30 and 40 hours. The wage difference is $14.75 (minimum hourly wage) x 10 or $147.50. After the means-tested tax credits are applied, the gap closes to around maybe $30. The Left would cry blue murder over someone working for $3 an hour - slave rates. Yet the wage subsidies they support create just that situation. Second thing. Someone working at the minimum wage with no children will be earning $472 weekly ($590 less 20% tax). If they lived in South Auckland and rented at $220 a week, they would be eligible for $47 weekly assistance (using the AS calculator). Their take-home income would therefore be $519 a week. 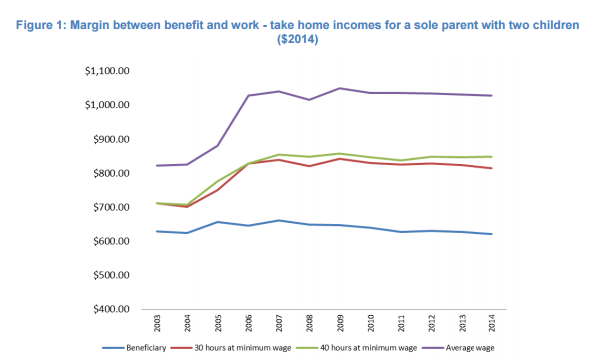 The sole parent with two children in South Auckland has a 'take-home' income of $642 weekly. Yes, I am comparing apples and oranges. But here's why. Before she becomes a sole parent, a young woman working and earning $519 doesn't see $642 as such a bad deal. Stay home with the babies and get paid considerably more. Finally, I am pleased to see the actual margins here for the first time. The difference the IWTC credit has made - on average - has always been difficult to ascertain. In this scenario it looks like around $200 weekly, even at full-time employment. Hopefully it is enough to cover the costs of working like transport, clothing, and childcare. 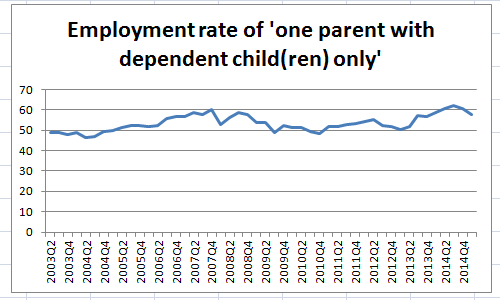 Some indication of whether it is might come from the sole parent employment rate over the same period. Very slow improvement (GFC effects aside). Lets hope the benefit increase doesn't alter this rather tenuous trend. I guess the pertinent question is, for someone who moves in low income circles, would you be prepared to forgo quarter of your income if it meant staying home with the kids and not having to go to work every day? Still dangerous and dishonest. Still costing the country every day. A boy who accidentally strangled himself after jumping from a toilet window at school has suffered significant brain damage, his father says. What did you think when you read just the headline? Yesterday Max Rashbrooke, campaigner against inequality had a column published in the DomPost. In a system where income goes disproportionately to the already well-off, ordinary workers are missing out on the rewards of their efforts, to the tune of billions of dollars a year. Welfare benefits, cut by a quarter in 1991 and increased just 8 per cent in the last budget, are far too low to meet people's basic needs. The result is a doubling of child poverty and the return of childhood diseases unknown in most developed countries – a national embarrassment, as one researcher described it. Our cold, damp homes can be death traps, as a recent child fatality tragically showed. Our still-excellent schools are buckling under the pressures of dealing with children whose parents can't afford to buy them warm clothing, feed them breakfast, or provide a quiet space for studying. In 2001 there were 1,814 substantiated findings of physical abuse against children. By 2008 the number had grown to 2,232. At March 2015 the number has grown to 3,144. A 23 percent rise in the first seven year period. A 41 percent rise in the latter 7 year period. The Government's latest report card for the public service shows an increase in the number of children and young people being assaulted - a trend that Labour describes as "dreadful". The trend was also "dreadful" under Labour. Perhaps less dreadful but dreadful nevertheless. The politicisation of this awful blight gets us nowhere. Naturally any incumbent government can find explanations eg greater reporting and so greater opportunity to discover and substantiate. Naturally the opposition can discount this. 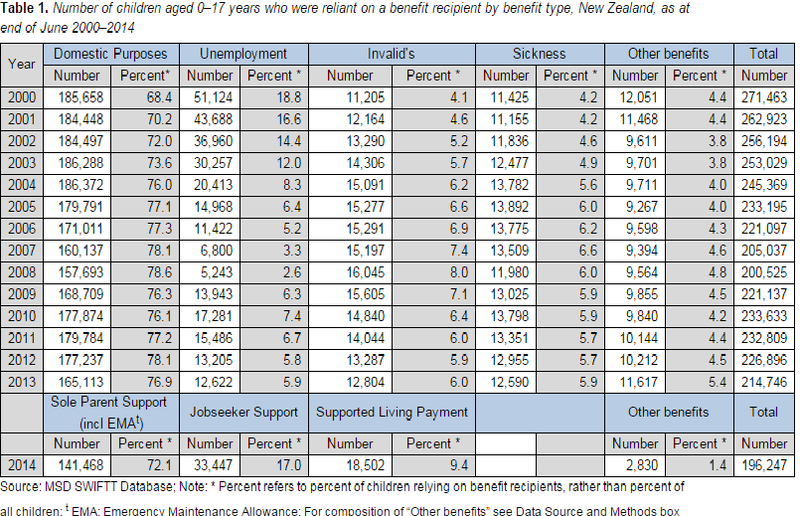 Bill English says there are 42,000 fewer children on benefits since 2012. That means there are now 184,896. That's lower than when we briefly had the lowest unemployment rate in the OECD. Just goes to show how unrelated the two things are. Researching something else yesterday I came across this story and it really impressed me. Capitalism with generosity. While opposed to the state redistributing wealth by compulsion, my ideal is greater redistribution through voluntary actions like those shown by Dan Price. The story is from a couple of months back so apologies if it's old news. It's still excellent and unusual news. I am not a green eyed enviest but there are some ridiculous salaries paid in this country too - especially among those in the state sector. I am currently watching one such beneficiary to see what he does to earn his almost $1 million a year salary. The call from New Zealand researchers for all teen girls to be fitted with long-term contraceptive devices is not as radical as many think. In fact, a similar free birth control scheme has been a huge success in the US state of Colorado.The state saw its teen pregnancy birthrate plunge by 40 per cent from 2009 to 2013, abortion rates also saw a 42 per cent drop.Colorado health officials started the experiment six years ago. The scheme offered free intrauterine devices (IUDs) to teenagers and women in financial hardship. The implants can prevent pregnancy for up to 10 years. For context the overall US teen birth rate was 39.1 in 2009 down to 26.5 in 2013 - a 32% drop. And in New Zealand it's fallen from 29.59 per 1,000 15-19 year-olds in 2009 to 21.54 in 2013 - a 27 percent drop.It dropped a further 2 percent to 19.00 in NZ in 2014. The 'free' birth control in Colorado will have played some role, as no doubt, have WINZ grants for LARCS in NZ. The great thing is this significant downward trend across English speaking countries. I think it's about education, welfare reforms and contraception. "The Ministry is forecasting to administer $24.1 billion in government expenditure in 2015/16, with departmental expenditure only six percent of the total Vote. All other areas are driven by policy settings that we are unable to change without changes in Government policy. Treasury has assessed the risk to the medium-term sustainability of the Ministry’s departmental expenses as amber. 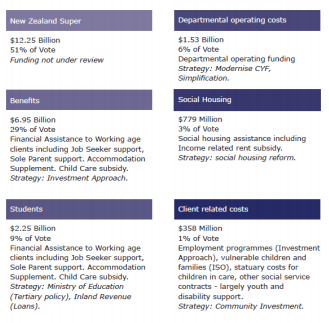 Concerns are primarily around the sustainability of New Zealand Superannuation payments and the necessity to manage personnel costs, IT spending and property costs"
"...Between 2015/16 and 2018/19 the total Vote is forecast to increase by $2.3 billion. We are experiencing an increase in required support for a significant number of our clients (beneficiaries, students, retirees and vulnerable children)...Demand for our services is changing as vulnerable population groups come under increasing financial pressure, especially in relation to housing affordability. There is an increasing focus and awareness of the scale of poverty and vulnerability amongst our children and less patience with government’s strategies for addressing it. Our population is ageing, and also becoming more diverse. The move in the population away from rural areas to large urban centres has increased the vulnerability of some rural communities. Many of these communities are disproportionately or predominantly Mäori who in turn have a much younger profile than the rest of New Zealand. Twenty five percent of the population under 24 years are Māori and this proportion is expected to rise. Demand for our services has changed in response to these demographic and socio-economic trends. " Interesting to see MSD getting political here by commenting that, "There is an increasing focus and awareness of the scale of poverty and vulnerability amongst our children and less patience with government’s strategies for addressing it." Really? What do they base this on? And it is then noticeable that they don't comment on the public attitude to Super spending given the Treasury warning. 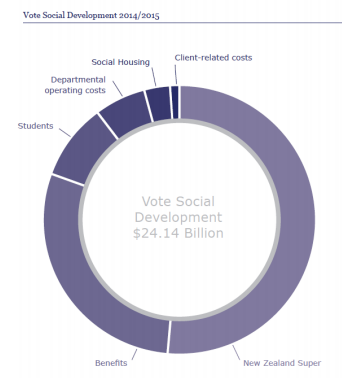 MSD seems to be making a case for increasing their Vote, and, when coupled with the child poverty comment, give a direction to raise it by higher taxation. 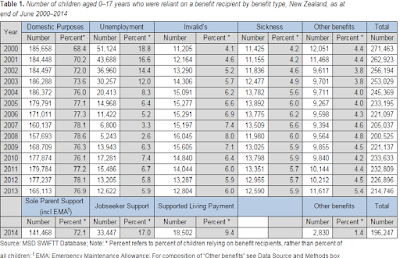 Equally interesting is the reference to Maori rural communities which I've been banging on about since the Jobs Jolt days when Labour tried to prevent the unemployed from moving to them but crucially didn't include sole parents. This is the first official recognition of this problem I have seen.